Is Aung San Suu Kyi finally being ditched by those who fell in love with her steadfast resistance in the face of Burma’s severe repression all those years ago? This appears to be the case and justifiably so. The most recent example of how and why she is on a downward spiral can be gleaned by the decision to have her award revoked by the City of London Corporation. The award in question was the honorary freedom award granted to Suu Kyi In May 2017. At the time, it said the award – the highest honour the City of London can bestow upon an individual – was given “in recognition of her non-violent struggle over many years for democracy” and ironically for “her steadfast dedication to create a society where people can live in peace, security and freedom”. The reason advanced by the City of London is that she failed to speak out and acknowledge that genocide against the country’s Muslim Rohingya population in Rakhine state has and is being perpetuated. By now it is a well established fact that Myanmar’s military have committed horrendous atrocities resulting in the death of tens of thousands of Rohingya and hundreds of thousands have been forced to flee to neighbouring Bangladesh. Described by the UN as the world’s most persecuted people, the Rohingya have had to endure heightened fears of attack since dozens were killed in state-engineered violence in 2012. Throughout the years which witnessed the slaughter of Rohingya Muslims, Aung San Suu Kyi remained silent while enjoying the limelight and accompanying accolades for her status as an icon of human rights. Her celebrity profile – which some have compared to Nelson Mandela – has come crashing down, all due to her reluctance to take a tough stance against her own institutions of state. Neither she nor the military thugs responsible for the violence against the Rohingya, can plead ignorance of the dastardly deeds committed. The UN has documented mass gang rapes, torture, killings, arson and forced disappearances committed by the regime’s forces. As suggested by a UN report, there cannot be any dispute that these barbaric violations may constitute crimes against humanity. If indeed prosecutors from the International Criminal Court do decide to proceed, one hopes that Aung San Suu Kyi will be hauled to The Hague alongside her country’s military leaders. Towards the end of 2018, Amnesty International (AI) led what’s regarded as a remarkable breakthrough for human rights activists when it stripped Suu Kyi of its highest honour. By withdrawing the award, AI did not mince its words about the reason: it was due to the Myanmar leader’s shameful betrayal of the values she once stood for! Here was the long-celebrated and idolized Nobel Laureate being humiliated publicly for turning her back on thousands of Rohingya prisoners of conscience, a situation familiar to her, and for which Amnesty honoured her with the Ambassador of Conscience Award. Aung San Suu Kyi is not a mere bystander. 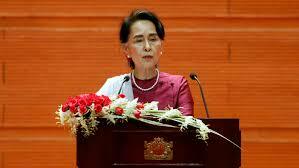 As the effective leader of Myanmar, she failed in her duty to protect her own citizens. It is not surprising therefore to understand Amnesty’s disappointment the she had not used her political and moral authority to safeguard human rights, justice or equality. Activists claim that Suu Kyi’s government has become increasingly authoritarian, failing to use its overwhelming parliamentary majority to scrap British colonial-era laws used to stifle dissent, while tightening restrictions on civil society. While Suu Kyi faces the ignominy of losing her iconic status, the Rohingya are forced to endure an uncertain future in make-shift refugee camps in Bangladesh. Having suffered decades of persecution and scarred by ethnic hatred, they see no reason to trust leaders such as Suu Kyi, who in any event haven’t yet made any attempt to win their trust. Ironically, as leader of Myanmar, Suu Kyi has barred the UN Special Rapporteur from visiting the country. During her years of incarceration, global sympathy for her cause grew precisely because the military junta denied human rights groups access to her. Myanmar’s former icon whose plight mobilized the world has sadly become a huge liability for the same cause: freedom, dignity and equality.